Given my love for an avocado related weekend breakfast, I often have left over avocado lurking in the fridge through the week. Keen to include it within my main meals in a low SP manner, last night I thought it may be a nice addition with salmon. We used Tesco’s Wild Salmon Fillets as they have a much more meaty flavour and are an amazing colour. They really stand up well to the spices when marinaded too. At only £1 more than the regular fillets I really think its worth the extra for the flavour. If you don’t want to spend the extra or just fancy using the regular salmon fillets this would be just as good however as the spice marinade really is something special. I paired this with an avocado salsa as I had half an avocado lurking in the fridge. If you are looking to lower the points, you could replace this with a 0sp tomato salsa (just replace the avocado with quartered cherry tomatoes). I also served this with a small portion of coriander lime rice and some pak choi. Not only was this a delicious dish but the whole thing is cooked and on the plate in around 15 minutes. In a bowl mix together the spices, honey, lime zest and juice and water. Once combined add the salmon to the bowl and coat well with the marinade. Cover the bowl with some tin foil and pop in the fridge for 15-30 minutes to marinade. Meanwhile, to make the avocado, pop all the ingredients into a bowl and roughly combine. I didn’t mash the avocado as I wanted to be able to eat some nice chunks of it with the salmon. Pop the rice on and cook according to the packet instructions. Once drained add the spring onions, coriander and lime juice and mix well. Whilst the rice is cooking, pre heat the grill and then grill for 5-10 minutes until cooked to your liking. 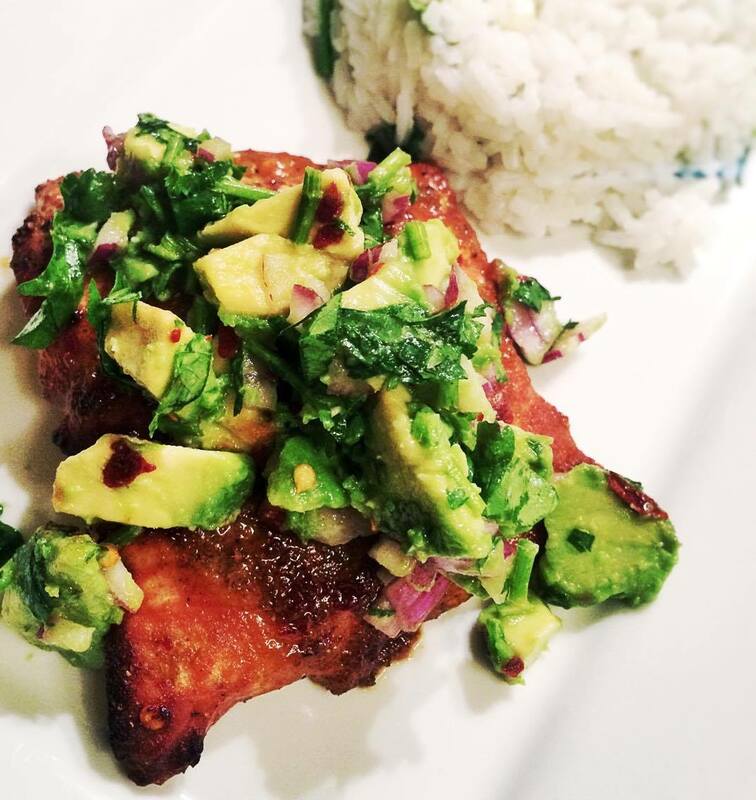 Pop the salmon on a plate, top with the avocado and serve with the coriander lime rice. Serve with a slice of lime to squeeze over the salmon. Oh wow, I can highly recommend this…it was delicious! I nearly couldn’t be bothered making it as I was hungry and a bit grumpy, but it was ready in 20mins and completely worth it! So pleased you enjoyed it Claire, I love how quick and easy it is!